I LOVE die cuts. Layers add dimension but not bulk. Die Cut Diva's blog has been in my bookmarked favourites for a little while. They even have die cuts for sale that make 3-D shapes! I just adore this coffin for Halloween! Die Cut Diva has a BLOG CANDY GIVEAWAY going on right now. You can win a Fall Kit for card making. This kit has a very earthy, natural colour scheme - good for any occasion! Take a look at Die Cut Diva's fabulous designs. I'm jealous I didn't think of the name first! Happy Thanksgiving to everyone in Canada! We had great eats and lots of family over. The next calendar event is HALLOWEEN! So, here's a free poem from me to put in your Halloween cards this year. It’s the time of year that monsters come out. Spooks do their spooking and bats fly about! There are werewolves and witches and all things between! Here’s to a fun and Happy Halloween! The October 2009 Etsy for Animals (EFA) challenge for members is "Halloween Cats". 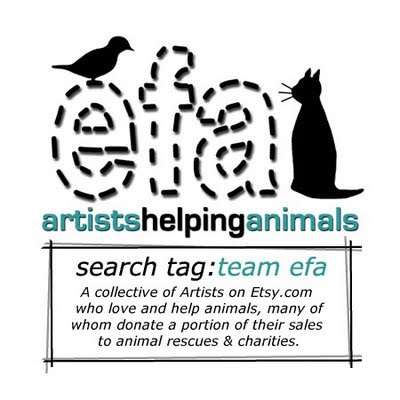 Member artists had to craft something cat related and the entries will be featured on the EFA challenge blog all month long. I just love the kitty Halloween tags by ShesBattyDesign there! I've got one available on my Etsy site (in USD) and one on iCraft (CAD). 10% of the proceeds from this card, if sold on Etsy, will go the EFA animal charity of the month! I just love Halloween! Stay-tuned to the blog. I will be posting a freebie within the month of October! Ensorcelled Minds Inc. is a proud contributor to this year's It's All in the Bag vegan sampler bags - the Holiday edition. 100% of the proceeds from the sales of these bags will go to an animal sanctuary. Here's what I've got in the bag!